McCollum noticed the tweet and tweeted out one of the best replies in the history of twitter dot com. In three simple words with no punctuations, McCollum was able to voice out his frustrations about not having won a Playoff game after being swept in last year’s postseason. Well, today, McCollum fulfilled his promise of trying to win one for Jennifer. The Blazers opened their series against the Thunder with a big win, and McCollum was a big part of that win. He dropped 24 points on the Thunder to help the Blazers take a 1-0 series lead. McCollum’s back court partner, Damian Lillard also made up for his failures in last year’s Playoffs. After being locked up by the Pelicans back court last season, Lillard came out firing against the Thunder this season. The first shot he let loose was an absolute bomb from the Moda Center logo from more than 30 feet way. Lillard time also came a bit earlier than usual. With a little more than 2:30 left on the clock and the Thunder making a run, he launched a pull-up dagger from nearly the same distance as his first shot. 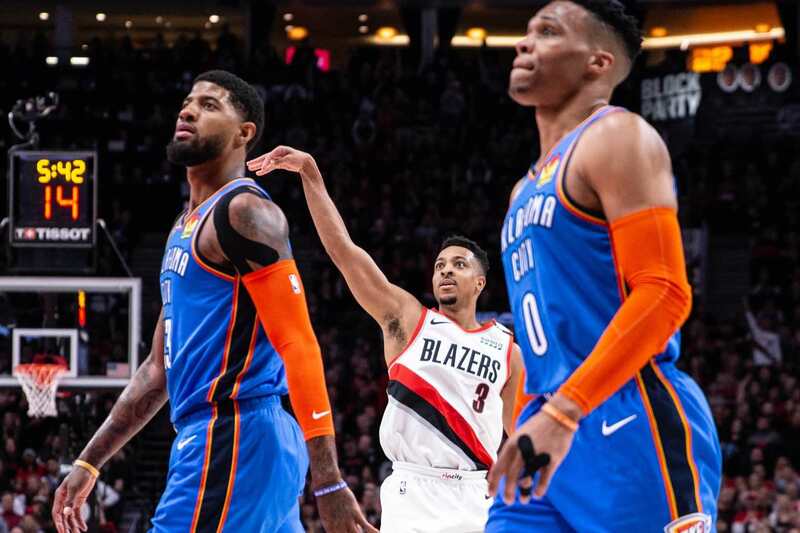 The shot splashed in giving the Blazers a four-point cushion, enough survive the Thunder run. After the game, both the Blazers and McCollum gave their Game 1 inspiration a proper shoutout. Houston versus Utah was a battle of styles. The Rockets had a top-two offense in the regular season. They had the second best offensive rating in the NBA at 114.8, a tick below Golden State’s league best number. Utah was the second best defensive unit in the NBA, allowing only 105.2 points per game. The Rockets were going to unleash James Harden, the best offensive player in the NBA. The Jazz boasted Rudy Gobert, a game-changing force on defense. This was supposed to be a close series between the fourth and fifth best in the West. Supposed. The Rockets absolutely massacred the Jazz defense in Game 1. Houston dropped 122 points on 50% shooting on the Jazz. That included an embarrassing 62 points in the paint, an area that Gobert was supposed to dominate in this series. The Rockets had seven players score in double figures and they only played nine guys. Harden finished with a game-high 29 points and had 10 assists. He may not have scored 30 but he detsroyed Utah’s gimmicky, one-sided defense with smart passes as soon as he got to the lane. The Jazz can’t afford this kind of defensive effort against an offense like the Rockets have. Harden and Chris Paul, masters of space and timing will cut them up to pieces. This season, NBA teams averaged 111.2 per game, the 11th highest mark in NBA history. More importantly, this is the highest scoring has been since 1971. But that scoring boom was nowhere to be found during Game 1 of the Celtics-Pacers series. It was a low-scoring gritty affair to open their series. The Pacers were missing one of their best offensive players and now that they’re in the Playoff grind, their offense was affected. Indiana scored only 74 points on 33% shooting. They only had two players score in double figures led by 14 points from Cory Joseph off the bench. The Celtics fared slightly better. They had Kyrie Irving’s offensive wizardry to carry them through stretches of the game. The Celtics pulled away in the third quarter of the game when they outscored the Pacers 28-6. There’s a chance this match-up could be a remake of the rough and tough Pacers-Celtics battles in the mid-2000s. Both Boston and Indiana are tough, hard-nosed teams willing to do the dirty work to advance in the Playoffs.